Hello and welcome to my blog for the special Thankful blog hop with the Peachy Keen Stamps design teams (past and present). If you are coming from Leanne's blog, you are in the right place.....if you just happened upon my post and would like to join in this super fun blog hop, then hop back to the Peachy Keen Stamps blog to get started and to see all the details. I used some 4 1/2 x 6 3/4 inch glassine bags and I sprayed them with some Tattered Angels mists to give the bags a little bit of color. The tags are cut out with my Cricut and the Art Philosophy cartridge. 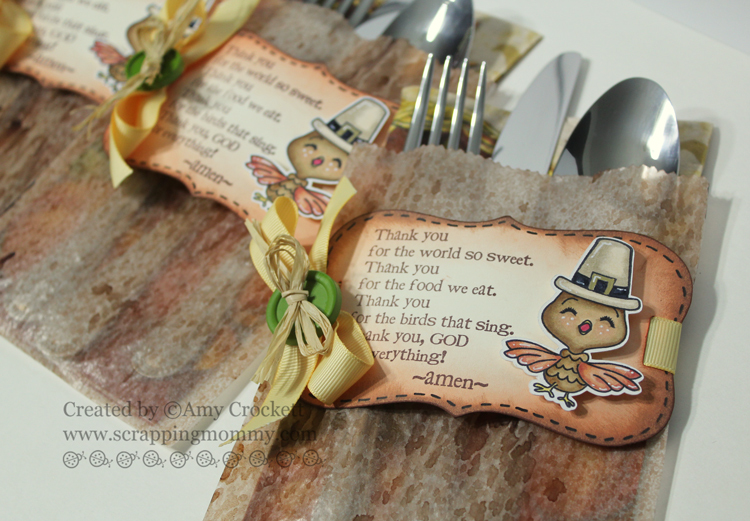 The adorable little turkey and saying are from the Lil Tweets - Thanksgiving set from Peachy Keen Stamps. I colored in the little turkey with my Copic markers and then added some white pen details. I tied them on the bags with some yellow ribbon and finished them off with a green button and some raffia. Before you continue on the hop, I would like to share with you some things that I am thankful for. I am thankful for God's love....I see it every day. I am thankful that He has sent me my wonderful husband and my beautiful children.....they are the greatest blessings in my life. I am thankful for the roof over our heads and for the sustaining food and clean water I have access to. I am also very thankful for the wonderful talent that He has blessed me with and that I am able to share it with you. what a great idea using the glassine bags!! These came out adorable!! great coloring on that little birdie! These are ADORABLE Amy!!! LOVE this idea!!! Adding the color to the bags was a stroke of genius! Absolutely adorable! These are so cool Amy!! Love this idea! Great idea Amy! Love the Lil Tweets. What an adorable place settings, Amy! love, love, love these place settings. Rosemary R.
What a great idea! I'm searching for a project that my grandsons and I can do for Thanksgiving dinner. This might be it! What a cute idea...I will steal this for sure. I love this idea! I serve about 35 family members on Thanksgiving and this is an idea I will put to use this year! 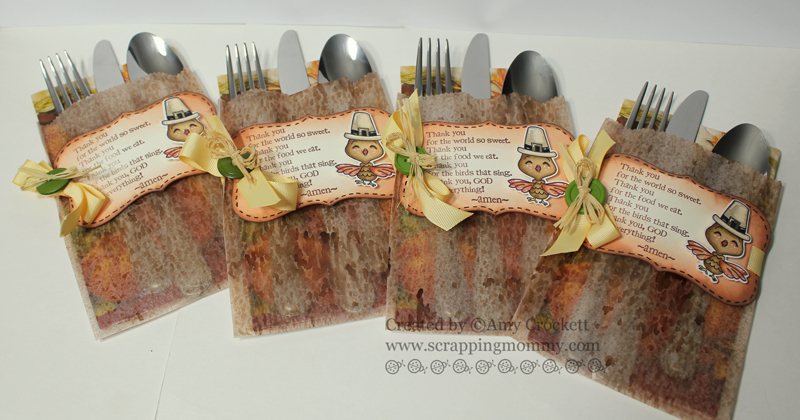 I serve buffet style and this idea is so much cuter than just wrapping the forks, knives, and spoons up in a napkin! Thanks you...also, your design and coloring is lovely. Amy ~ Oh my word!! I ADORE these!! What a GREAT way to use the glassine bags and that prayer!!! Too CUTE and PERFECT!!! I must say what you are grateful for just touched my heart!! I couldn't agree more!!! Another AMAZING creation too!!! Such a GREAT project and a perfect touch for the thanksgiving table! I LOVE this!!!! These are so cute! Love the color/texture you got on the bags and the turkeys are adorable! Your place settings are so cute! What a great idea. Love the place setting holders. I may have to borrow this idea. What sweet place setting holders! I love this idea..mind if I do a little scraplifting?! So cute! Love it! Love it! Such a great idea! TFS! This is such a great idea. I thought you bags were material until I read that they were glassine bags. That little tukey is just the cutest!! I LOVE THIS IDEA SO DAM CUTE!!!!!!!!!! Wow!! That looks beautiful and that idea is genius!! I LOVE it!! Wow! I love these bags! Too cute! These are amazing what a great project!! Thank you for sharing your talents with us!! Amy, you are so talented! TFS!! Thanks for a chance tow in! fabulous idea, they are just darling and will look great on the table. I wish you and yours a wonderful holiday season. wow--these really came out awesome! So cute and so much fun! 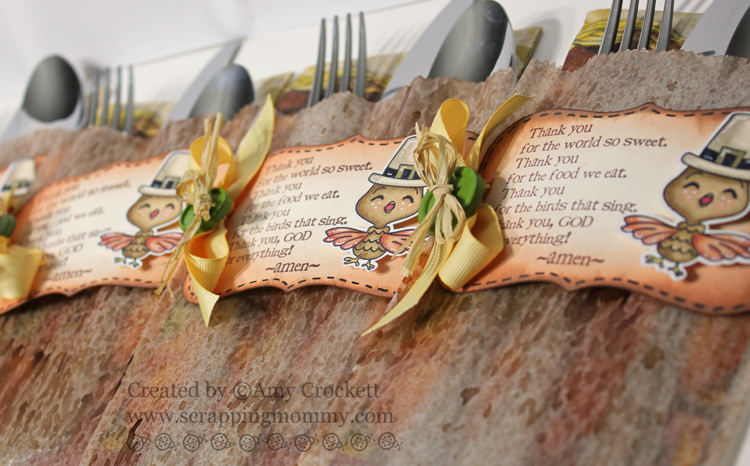 I love these and I'm betting they are going to look wonderful on your Thanksgiving table---too cute! Wow....what a great idea. Very Cute! Thanks for sharing. Love the idea of silverware bags! Also love the ide of spraying the clear bags to give them color! Such cute tags and table decor. Such cute table decor. Love it. Such a good idea for that stamp set! Thanks for the inspiration! I've never seen that done ~ terrific idea! Thanks so much for sharing. What a terrific idea. You did a great job, your table will look amazing. I also enjoyed reading your thankful list. Thank you. Man I'm getting such great ideas for our thanksgiving table but we aren't having the get together at our house this year. (husband is having surgery the 19th) I'm taking notes for next year. lol. Oh Amy, these are adorable! I said this blessing when I was a little girl and the turkey is so precious. Thanks for sharing! WOW! Your flatware bags turned out just amazing, Amy! What a wonderful accent to the Thanksgiving table! Very, very well done!!! EEK! These are SOOO cute! I would be in awe if I sat down to a table that had these! Such a great idea and OH SO CUTE! These are awesome!! Love the look of the TA spray on the bags!! Amy, this is such a great idea and so cute. What a great idea ....love it! wow what a great idea for the table thanks Alyse D.
What a beautiful idea! I love that little prayer - perfect addition to a holiday table. TFS! I love reading what you all grateful for and your project is outstanding. I woul love to try making some of these. Wow, what a cute idea. Love the details. TFS. What a great ideaq! And so cute! WOW, the bags came out amazing, love the tags. What a great idea. This is AWESOME! !Love this idea! !Very Cute!Super Duper Cute!! WOW and OMG that is to cute I might have to craft lift that seeing I have to host TG TFS love it. What a cute idea! I think I may have to craft lift it too! OMG! These are so cute! Love that prayer, great idea, TFS! these are so great! love!